…I got to meet my cat behavior mentor, Pam Johnson-Bennett. Seventeen years ago I read Pam's book, “Think Like a Cat” and it changed my life. A light went off, a fresh awareness blossomed; cats are not humans in little furry outfits nor do they think like them. They think like cats. It may be stating the obvious, but understanding how to decode those motivations, behaviors is eye-opening. A cat peeing on the bed or other unwanted (by humans) behavior is perfectly appropriate in the cat-world. They're sending a message in cat-language, but when they live with humans who don't speak "cat," that's when conflict occurs. The meeting almost didn’t happen. I’m dealing with two sick 7-week old kittens, Weatherby and Willoughby, and I was worried about leaving them alone while Sam drove us to New York City to attend Pam’s Cat Wise Cat Cafe Tour (thanks to Wellness Natural Pet Food) at Meow Parlour.. It was to celebrate the launch of her latest book, Cat Wise. I knew there wouldn’t be another chance to speak with Pam and the timing couldn’t be better for Holly. I could ask Pam about Holly’s case and get feedback on whether or not I was nuts to take her to my home as part of the solution for her inappropriate elimination problems. I fed the kittens and cleaned their goopy eyes right before we left. I figured we could do the trip in about five to six hours, most of it being the drive-time between Newtown and New York City. It was a lovely cool spring afternoon and fortunately with good weather meant the drive time should go smoothly. We had planned to arrive by 6:30 PM but the traffic was so bad we got to Meow Parlour just as the event was going to get under way at 7:30. Thankfully, even though we were running late, I had a chance to get my photo with Pam. Many people didn't show up regardless of the event being booked solid. Not only was it rude of those folks to skip out, but I couldn’t imagine why they’d miss this rare opportunity to meet Pam if they were cat lovers. The good part about it was I got to have more time with Pam...and I freely admit that I was all "fan girl" with her. Totally embarrassing, but what the heck. I love PAM! She's my heroine! ©2017 Robin AF Olson. Pam giving out tips while one of Meow Parlour's foster kitties looks on. Pam gave the audience some great tips and things to think about to help them better understand their cat. 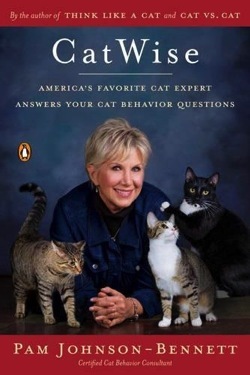 What delighted me is she was willing to take on cat behavior problems and offer suggestions. One of the folks there stunned some of us by saying she took her cat on the subway every weekend and that she was worried about the stress on the cat. Then she added, the cat traveled loose inside her PURSE. No wonder the cat was scared! Even though I wanted to scream at the woman, Pam was calm and relaxed. She gave very clear suggestions and explained why these things needed to be done. Meanwhile Sam and I were rolling our eyes at each other, stunned that anyone could be so foolish. I asked Pam about Holly and she began to suggest things I’d already done but didn’t have a chance to tell her. She quickly realized we were well down the path of things cat behaviorists can suggest. Then I told her about my out-of-the-box idea of bringing Holly to my home for kitten bootcamp. She said it was a good move and the right choice. She confirmed what I’d wondered from day one-Holly needs a buddy. Her peeing on even a shower curtain covered bed, on her “mom’s” side of the bed is saying she wants to bond with her family and is anxious they are going to leave her alone again. This explains why that after almost a week here, Holly has used her litter pan perfectly. Even though I'm not in the room that often, Holly has become friends with Andy and even Annie is starting to tolerate her. This was the answer I needed. Of course it begs the question of “now what?” "How do we take the next steps?" Holly has been introduced to Annie and Andy already and they do well together. Would Stephen and Kirsten go this far for Holly? I knew they’d be ok with a buddy-kitty for Holly, but two? At least they didn’t have to spend another thousand dollars doing more testing on Holly, so that was good news. This is somewhat uncharted territory. My gut says they should all three together because it would be easier on the family. It’s a known quantity. They don’t have to introduce a new kitten to Holly and frankly I don’t know what Holly might do in her home with a new, unknown cat there. Pee more? If they don’t do the introduction correctly, then what happens? BUT, it means adding two more cats because they want to keep one. That's just crazy! ©2017 Robin AF Olson. Pam Johnson-Bennett (left), me (center), Sam (right). I so was energized by talking with Pam. It also helped my confidence soar. I identified the problem early on but I had to go slowly and rule out other things before jumping to adding a new family member. The true test is to return Holly to her home. I could probably return her tomorrow, when the Kellogg ladies come to visit. It would mean Holly leaving two weeks early, but without Stephen home it wouldn’t be a fair test. And do I tell the Kelloggs NOW about what I’ve learned or wait at least another week to see if once Holly is settled down she’ll start to pee on the bed? As excited as I am I should wait a bit longer. Holly can stay here and I can be even more sure it’s the right thing by the time Stephen is back from being on tour. The only problem is, I just found an adopter for Annie and Andy.